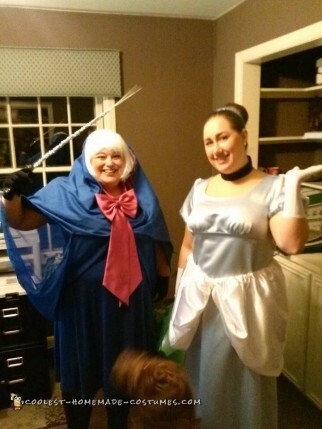 For my Fairy Godmother costume I created a cloak out of a few old shirts and wore a blue dress. Pulled a pink bow from an old prom dress To make neck bow. Wore white wig and made a fairy wand from a dowel and glued on some silver sequins. Very cheap and easy costume to match a Cinderella Theme or Disney Princess.